Accessible Italy provided me with a trip that I will never forget. I am an individual that has great difficulty with walking and climbing stairs. We decided to go in early May of 2007 before the crowds arrived. My wife and son traveled with me on this custom made trip. We traveled to Rome, Florence, and Siena. Accessible Italy provided us with an accessible van and an English speaking driver. We were also provided with English speaking guides in Rome, Florence, and Siena.The guides were very knowledgable and courteous and always on time, as was the van and driver.They really took the guess work out of traveling. We were met at the airport in Rome and quickly taken to our hotel which was accessible and very close to the Colisseum. After several days in Rome, we traveled to Florence by accessible van through the Chianti region with a stop at an old castle for lunch. While in Florence we had a side trip to Siena which was just beautiful. Our guide took us through the city using the most level route because of the wheelchair. I would reccomend Acessible Italy as they were just great in providing us with safe, timely, and courteous travel in Italy. The entire trip was planned via e-mail. All my questions were answered quickly and courteously. I would also like to mention Laura, the person who was so helpful and courteous in planning our trip. She was very understanding regarding my problems with walking and climbing stairs. She also was very prompt in answering my questions and concerns about accessible travel. She was more than helpful and I probably could not have made this trip without her help. This trip was huge success and was greatly enjoyed by my wife and son and of course, me. 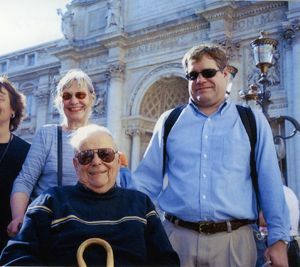 My husband Ken and I went to Italy for a 2-week honeymoon in June of 2004. We had no idea what the accommodations would be like as this was my first trip to Europe being wheelchair bound. We arrived home yesterday safely. I must thank you for providing such wonderful service, tour guides and transportation. They were all extremely professional and of high quality! I am in Ohio once again, and wanted to thank you and Miki for a fabulous trip. Our driver Massimo and guide Elio in Rome were delightful. Elio is extremely knowledgable and humorous. We thoroughly enjoyed the day. The van was perfect for our needs. Luca, our Florence guide, was knowledgeable...The van was perfect again, despite the torrential rain in Pisa. Thank you for helping make our cruise so special. I spoke to Mrs. Young today, and they had a wonderful time in Italy. Thank you for all your help with planning this special trip. Thank you for your assistance for my family to go to Ostia Antica. Sandro was very pleasant and helpful. Thank you also for your assessment that I wouldn't need someone for Florence. It worked quite well there to use my scooter. As you know, Venice was a totally different matter. If I'd had sooner help from my tour company, I would have gotten your assistance there as well. I'm attaching a picture that I took of Sandro with my boys - Patrick and Andrew. If you can, please give him a copy.